Ludwig Eduard Boltzmann (February 20, 1844 – September 5, 1906) was an Austrian physicist famous for his application of probability theory to the study of molecules in a gas. He used the results of his theoretical investigations to explain the thermodynamic properties of materials. He was one of the most important advocates of the atomic theory when that scientific model was still highly controversial. Other scientists extended his work to express what became known as quantum mechanics. His personal life, however, was clouded with bouts of depression and he ended it with suicide. Boltzmann was born in Vienna, then capital of the Austrian Empire. He was the eldest of three children of Ludwig Georg Boltzmann, a tax official, and Katarina Pauernfeind of Salzburg. He received his primary education from a private tutor at the home of his parents. Boltzmann attended high school in Linz, Upper Austria. As a youth, his interests encompassed literature, butterfly collecting, and music. For a short time, he studied piano under the famous composer Anton Bruckner. At age 15, Boltzmann lost his father to tuberculosis. Boltzmann studied physics at the University of Vienna, starting in 1863. Among his teachers were Josef Loschmidt, who was the first to measure the size of a molecule, and Joseph Stefan, who discovered the law by which radiation depends on the temperature of a body. Stefan introduced Boltzmann to Maxwell's work by giving him some of Maxwell's papers on electricity, and an English grammar book to help him learn English. Loschmidt and Stefan, Boltzmann's chief mentors during this period, became his close friends. The laboratory in which they worked, in a private house separate from the university campus, was sparsely equipped. "We always had enough ideas," Boltzmann would later say. "Our only worry was the experimental apparatus." Boltzmann published his first paper, on the electrical resistance between different points on a conducting sphere, in 1865. He received his doctorate in 1866, working under Stefan's supervision. In this same year, he published his first paper on the kinetic theory of gases, entitled, "On the mechanical significance of the second law of thermodynamics." In 1867, he became a Privatdozent (lecturer). Boltzmann worked two more years as Stefan’s assistant. The following year, Boltzmann published a paper, "Studies on the equipartition of thermal kinentic energy among material point masses," in which he attempted to express the manner in which energy was distributed among the trillions of molecules in a sample of gas. In 1869, at age 25, he was appointed full Professor of Mathematical Physics at the University of Graz in the province of Styria. In 1869, he spent several months in Heidelberg working with Robert Bunsen and Leo Königsberger and then in 1871, he was with Gustav Kirchhoff and Hermann von Helmholtz in Berlin. While working with Helmholtz, he experimentally verified an important relationship between the optical and electrical properties of materials. This relationship was seen as a confirmation of Maxwell's theory, of which Helmholtz was a staunch supporter. Boltzmann also made extensive use of the laboratory of a colleague at Ganz, August Toepler. In 1872, Boltzmann, who had been working on his treatment of the kinetic theory, published a paper that took into consideration the dimensions of molecules in its calculations. In this paper, entitled "Further studies on the thermal equilibrium among gas molecules," he for the first time wrote an equation representing the mathematical conditions that must be satisfied by a function representing the velocity distribution among molecules in motion. It is today referred to as the Maxwell-Boltzmann distribution, since Maxwell had derived a similar equation. By applying this equation, Boltzmann could explain the properties of heat conduction, diffusion and viscosity in gases. In the same year, using his equations, he attempted to explain the second law of thermodynamics in terms of the kinetic theory of gases. His final expression of this thesis is called the H theorem. Loschmidt later objected to Boltzmann's findings because it basically showed that an irreversible process is the result of a reversible process, which violates conservation of energy. He also noted that Boltzmann's work did not take into consideration the effect of a gravitational field on the kinetic theory. Boltzmann defended his work, saying that the apparent contradiction is due to the statistical probabilities involved. In his later papers he worked out the gravitational effects on a gas. In 1873, Boltzmann joined the University of Vienna as Professor of Mathematics, where he stayed until 1876, when he succeeded Toepler as director of the Physics institute at Graz, winning the position over Ernst Mach. Among his students in Graz were Svante Arrhenius and Walther Nernst. He spent 14 years in Graz. 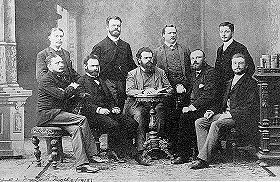 Ludwig Boltzmann and co-workers in Graz, 1887. (standing, from the left) Nernst, Streintz, Arrhenius, Hiecke, (sitting, from the left) Aulinger, Ettingshausen, Boltzmann, Klemenčič, Hausmanninger. In 1872, long before women were admitted to Austrian universities, Boltzmann met Henriette von Aigentler, an aspiring teacher of mathematics and physics in Graz. She was refused permission to unofficially audit lectures, and Boltzmann advised her to appeal; she did, successfully. She and Boltzmann were married On July 17, 1876; they had three daughters and two sons. In 1877, Boltzmann tried to further clarify the relationship between probability and the second law of thermodynamics. He introduced an equation that showed the relationship between entropy and probability. Mechanics, he thought, could not account for a complete explanation of the laws of thermodynamics, and he introduced "the measurement of probability." These and similar concepts being explored by J. Willard Gibbs formed the foundation for the field of statistical mechanics. Between 1880 and 1883, Boltzmann continued to develop his statistical approach and refined a theory to explain friction and diffusion in gases. In 1885, he became member of the Imperial Austrian Academy of Sciences and in 1887, he became the President of the University of Graz. It was around this time that Heinrich Hertz discovered the electromagnetic waves predicted by Maxwell. Inspired by this discovery and reminded of his earlier electromagnetic researches, Boltzman devised demonstrations on radio waves and lectured on the topic. 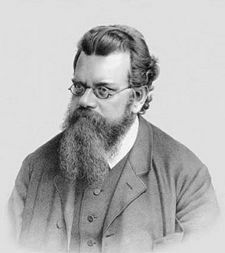 In 1889, Boltzmann's eldest son, Ludwig, suffered an attack of appendicitis, from which he died. This was a source of great sorrow to Boltzmann. Boltzmann was appointed Chair of Theoretical Physics at the University of Munich in Bavaria, Germany, in 1890. In 1893, he succeeded his teacher Joseph Stefan as Professor of Theoretical Physics at the University of Vienna. Boltzman spent much of the next 15 years of his life defending the atomic theory. The scientific community of the time was divided into two camps, one defending the actual existence of atoms, and the other opposing the theory. Boltzmann was a defender of the atomic theory, and in 1894, he attended a meeting of the British Association for the Advancement of Science during which the two different positions were debated. At a meeting in 1895, in Lubeck, another set of views, represented by their respective proponents, were aired. Georg Helm and Wilhelm Ostwald presented their position on energetics, which saw energy, and not matter, as the chief reality. Boltzmann's position appeared to carry the day among the younger physicists, including a student of Max Plank, who had supported Boltzmann in the debate. Boltzmann did not get along with some of his colleagues in Vienna, particularly Ernst Mach, who became a professor of philosophy and history of sciences in 1895. Thus in 1900, Boltzmann went to the University of Leipzig, on the invitation of Wilhelm Ostwald. After the retirement of Mach due to poor health, Boltzmann came back to Vienna, in 1902. His students included Karl Przibram, Paul Ehrenfest, and Lise Meitner. 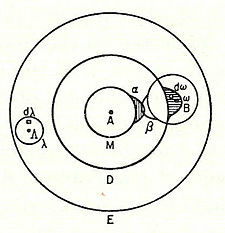 Boltzmann’s 1898 I2 molecule diagram showing atomic “sensitive region” (α, β) overlap. In Vienna, Boltzmann not only taught physics but also lectured on philosophy. Boltzmann’s lectures on natural philosophy were very popular and received considerable attention. His first lecture was an enormous success. Even though the largest lecture hall had been chosen for it, the audience overflowed the hall. Because of the great successes of Boltzmann’s philosophical lectures, he received invitations from royalty for private audiences. Boltzmann suffered from a number of infirmities. When he was a student, he often studied in dim candle light, and later blamed this sacrifice for his impaired eyesight, which he endured more or less throughout his career. He also suffered increasingly from asthma, possibly triggered by heart problems, and from intense headaches. On the psychological and spiritual level, Boltzmann was subject to rapid alternation of depressed moods with elevated, expansive, or irritable moods. He himself jestingly attributed his rapid swings in temperament to the fact that he was born during the night between Mardi Gras and Ash Wednesday. He had, almost certainly, bipolar disorder. Meitner relates that those who were close to Boltzmann were aware of his bouts of severe depression and his suicide attempts. On September 5, 1906, while on a summer vacation with his wife and youngest daughter in Duino, near Trieste, Boltzmann committed suicide by hanging himself. Much of the physics establishment rejected his thesis about the reality of atoms and molecules—a belief shared, however, by Maxwell in Scotland and Gibbs in the United States; and by most chemists since the discoveries of John Dalton in 1808. He had a long-running dispute with the editor of the preeminent German physics journal of his day, who refused to let Boltzmann refer to atoms and molecules as anything other than convenient constructs. Only a couple of years after Boltzmann's death, Perrin's studies of colloidal suspensions (1908-1909) confirmed the values of Avogadro's number and Boltzmann's constant, and convinced the world that the tiny particles really exist. relating probability to the thermodynamic quantity called entropy is engraved on Boltzmann's tombstone at the Vienna Zentralfriedhof. Boltzmann's bust in the courtyard arcade of the main building, University of Vienna. Boltzmann's grave in the Zentralfriedhof, Vienna, with bust and entropy formula. In principle, the above equation completely describes the dynamics of an ensemble of gas particles, given appropriate limiting conditions. It is possible, for example, to calculate the probable distribution of velocities among an ensemble of molecules at a point in time, as well as for one molecule over a stretch of time. The Boltzmann equation is notoriously difficult to solve. David Hilbert spent years trying to solve it without any real success. The form of the collision term assumed by Boltzmann was approximate. However, for an ideal gas the standard solution of the Boltzmann equation is highly accurate. Boltzmann tried for many years to "prove" the second law of thermodynamics using his gas-dynamical equation—his famous H-theorem. It was from the probabilistic assumption alone that Boltzmann's success emanated. The rate at at which energy radiates from a hot body is proportional to the fourth power of the absolute temperature. This law was established experimentally by by Jožef Stefan in 1879. Boltzmann, who was Stefan's student, successfully derived the law from theoretical considerations in 1884. Boltzmann refined the mathematics originally applied by James Clerk Maxwell to develop the kinetic theory of gases. In this he made great progress, and the body of work he left was extended by scientists searching for mathematical techniques to express what became known as quantum mechanics. In Boltzmann's personal life, he was subject to bouts of depression, which he may have repressed by keeping an arduous work schedule. This is what perhaps led to the mental instability that resulted in his suicide. Others have said that it was due to the attacks he received as a proponent of the atomic theory. These attacks may have opened up doubts in his own mind, as some of the best minds challenged aspects of his reasoning. It is the hazard of high-profile achievers that they may stray beyond the reach of their closest friends, and fall prey to the imbalances within their own psyches. Boltzmann's achievements will always be clouded with the tragedy of the circumstances surrounding his death, and the sadness to which his friends were subjected as a result of it. ↑ Washington Post, Lise Meitner: A Life in Physics. Retrieved August 24, 2007. Boltzmann, Ludwig. 1964. Lectures on Gas Theory. Berkeley: University of California Press. Brush, Stephen G. 1965. Kinetic Theory. Oxford: Pergamon Press. Everdell, William R. 1988. The Problem of Continuity and the Origins of Modernism: 1870-1913. History of European Ideas 9(5): 531-552. Lotka, A. J. 1922. Contribution to the energetics of evolution. Proc Nat Acad Sci USA 8(6): 147. Ruth Lewin Sime, Lise Meitner: A Life in Physics Chapter One: Girlhood in Vienna gives Lise Meitner's account of Boltzmann's life and career. Ali Eftekhari, Ludwig Boltzmann (1844 – 1906). John J. O'Connor and Edmund F. Robertson. Ludwig Boltzmann at the MacTutor archive. This page was last modified on 3 August 2018, at 16:43.